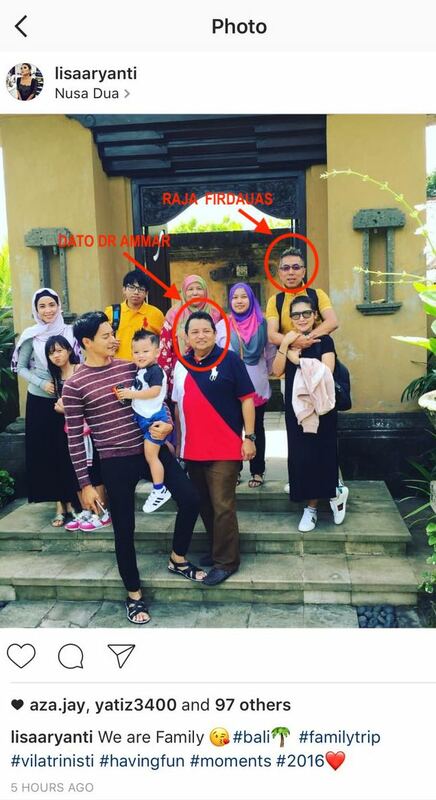 In 2016 Raja Firdaus’ wife Instangram posting showing both families of Dato Dr Ammar and Raja Firdaus were on a luxurious holiday and fun together in Bali. Dato Dr Ammar G Ghapar (Dato Ammar), Senior Director of Domestic & Events of Tourism Malaysia (TM). In 2016 he was then the powerful Senior Director of Administration, which comprised of Human Resources and Finance. Dato Ammar has a very close family friend by the name of YM Dato Sri Raja Mohd Firdaus Raja Zainal (Raja Firdaus), HERE. 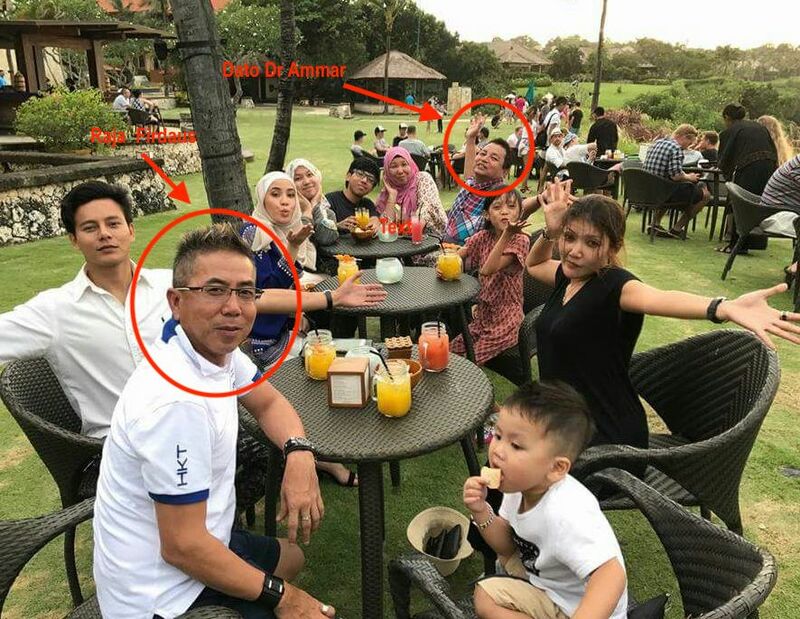 The two happy families were having fund together in Bali. Raja Firdaus was an ex-employee and a member of the top management of TM. He is an extremely talented businessman. It was an open secret that he had gone on family holiday with his close friend, Dato Dr Ammar G Gapar. Raja Firdaus was an ex-employee and members of the top management. of TM. He was an extremely talented businessman. He had been seen in photographs on family holiday with Dato Ammar. Raja Firdaus is also closed with the other little napoleons that matter in TM. 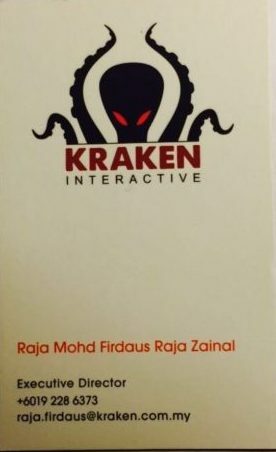 The Kraken Interactive Sdn Bhd’s name card of Raja Firdaus. Raja Firdaus is the Executive Director of Kraken Interactive Sdn Bhd(Kraken). He was the executive director with no shareholding. His director fees in Kraken must be big enough to make his appointment worthwhile! 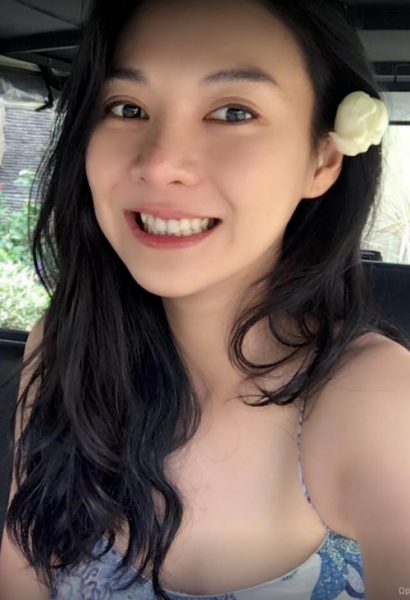 In 2016 Kraken was awarded a contract to provide the digital marketing platform for TM and it was a 100% non-Bumi company. By right, such an appointment was against the government policy. The Kraken contract had expired in December 2017. Having been paid the RM40 million, by now TM should have a working digital marketing platform. One can go to the TM’s website, there is no resemblance of a digital marketing platform, HERE. At the material time several of Raja Firdaus’ outfits have been awarded with many direct nego contracts to do billboard and other advertising for TM. It was due to the non-performance of Kraken that TM awarded the so-called digital marketing contract on VERY fast track to Geeko Tech Sdn Bhd, which was just a 5 month old company with no digital marketing experience at all! The date of registration was on 6-4-2018, two days after the Speedy Gonzales Geeko contract was entered into. Hence, prior to GE 14 TM under the chairmanship of Dato’ Seri Siew Ka Wei, TM rushed into a direct nego contract with Geeko Tech Sdn Bhd (Geeko) worth RM99.693 millions. It was popularly known as the “Speedy Gonzales Contract” whereby the said contract was evaluated, negotiated and sealed in one day, on 4-4-2018. On 4-4-2018 Geeko was not registered with the Ministry of Finance (MOF). The registration with MOF is a pre-condition for any company who want to do business with the government or its agencies. Ms Elizabeth Ken is the CEO of Geeko Tech Sdn Bhd. She is also the Media Specialist of Redberry Media Group. The brief background of Geeko. The CEO of Geeko is Ms Elizabeth Ken, who is the Media Specialist of Redberry Media Group (Redberry). Redberry is part of Ancom Bhd group of companies. By coincidence Dato’ Seri Siew Ka Wei is the Executive Chairman of Ancom Bhd and MD of Redberry! The business address of Geeko is a terrace house in SS2, Petaling Jaya. The summary of the scandalous RM99.693 millions Speedy Gonzales Geeko contract, HERE. Geeko was incorporated in November 2017 and one of its shareholders is KOPEMA, whose chairman is Datuk Musa Yusof, Senior Director International Promotion Division (Asia/Africa) in TM and Dato Ammar is the Deputy Chairman, HERE. KOPEMA is a Koperasi in the Ministry of Tourism & Cultures (MOTAC). At the material time, it owed MOTAC a huge sum of rental for the canteen. But it has fund to pay for the 15,000 shares in Geeko! Did KOPEMA pay for the 15,000 shares? It would be hard to believe that at the material time when Geeko Tech was incorporated, both Datuk Musa Yusof and Datuk Ammar (being the high ranking officers of KOPEMA) or in the early part of 2018 were not aware at all about the Speedy Gozales RM99.693 millions deal? Until this day, there was no announcement that this scandalous Speedy Gonzales Geeko contract has been terminated by TM. In June, a report had been lodged with MACC in connection with this scandalous deal. 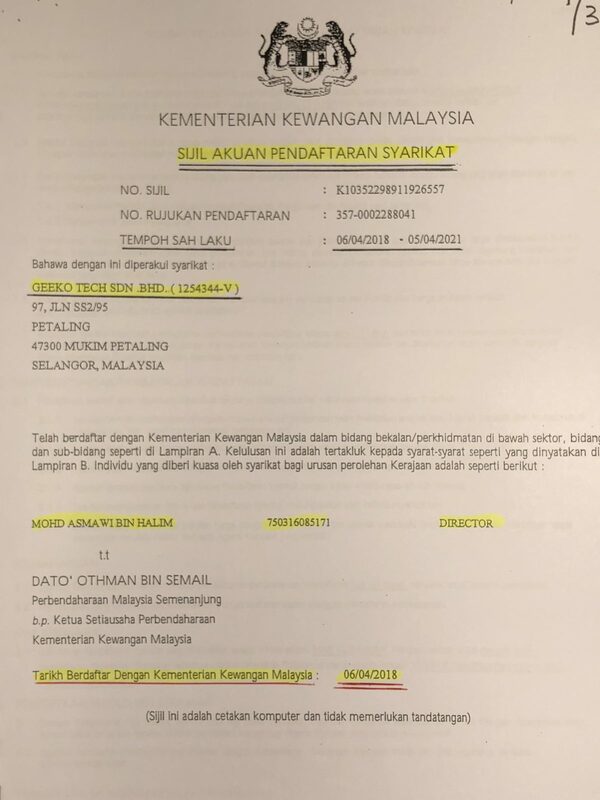 MACC should investigate into the contract with Kraken and all other direct nego contracts with the advertising companies that were connected with Raja Firdaus. Previous Prosecute Directors of UKSB! Next The ‘Speedy Gonzales’ Promotion! At last it has been exposed. When is MACC going to charge Siew Ka Wei and the little napoleons? Raja Firdaus and this little Napoleon need to be investigated. Raja Firdaus was seen on most of the trips with Ministers and the little napoleons. Heard the good news this morning. The acting DG Datuk Seri Khani has been transferred to Islamic Tourism Centre today. He unilaterally appointed Datuk Razif to be acting DG. Of course, he is praying for Razif to take over. Datuk Razif or Datuk Musa are not fit to be the acting DG or director of any department in TM. Razif has a good record of having MCs. Musa knew all along about the Geeko deal but chose to keep his eyes closed. The Kong Kali Kong has been kong-ed at last! Can still Kong in Bangkok. Kumpulan little napoleon telah kena Kong Kong Kong! Kesemua tak boleh tidur kerana ada banyak penyakit. Tak malu kah Datuk Seri Kong Kali Kong. Sekarang kena beku. Padan muka! Berita yang terbaik. Sorak! Sorak!Sorak! Datuk Musa appointed as KP will be a disaster for TM & Ministry. TM is habis! It is most rediculous that one of the Geeko man is the new KP of TM. It is business as usual in TM. It is the beginning of the end. There will be more Geeko deal in the making. God bless TM and MOTAC.